Sea creatures are set to shrink as the world’s oceans become more acidic. That is the startling warning given by an international group of biologists who have charted the likely impact of rising carbon dioxide levels on marine life. The group reveals that not only are hundreds of marine species likely to be wiped out as more and more carbon dioxide is dissolved in the Earth’s oceans but also that creatures that do survive – in particular those with shells, such as clams, oysters and snails – will be left puny and shrunken as a result. “We have already seen this effect in commercial oyster beds in the US, where marine farmers have had to stop growing young oysters in sea water because their shells could no longer form properly in our increasingly acidic seas. Instead they have to grow them in tanks where water acidity can be controlled,” said marine biologist Professor Jason Hall-Spencer, of Plymouth University. Scientists estimate that the oceans absorb around a million tonnes of carbon dioxide every hour. As a result our seas have become 30% more acidic than they were a century ago. 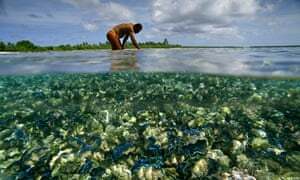 This increased acidity plays havoc with levels of calcium carbonate, which forms the shells and skeletons of many sea creatures, and also disrupts reproductive activity. These threats have led to the phenomenon of ocean acidification being dubbed global warming’s “equally evil twin”. Ocean acidification is not new, however. During the Permian extinction 252m years ago – an event linked to soaring atmospheric carbon dioxide levels triggered by volcanic eruptions – swaths of species were wiped out both on land and in the sea. At the same time, many of the marine creatures that survived were greatly reduced in size. Now scientists have shown this effect in operation today and have traced the cause. The work – funded by the EU MedSeA project and the UK Ocean Acidification Research Programme – was carried out by researchers working on the island of Vulcano, off Sicily. Its volcano, which has given its name to all other volcanoes, leaves a distinct sulphurous smell over its beaches of black volcanic sand and belches out about 10 tonnes of carbon dioxide a day. Much of this gas bubbles up through offshore vents, making the island’s coastal waters highly acidic. Close to the vents, nothing can survive – not even seaweed. Further away, the marine life increases. The intriguing difference for Hall-Spencer and his colleagues lay with several species of sea snail, in particular Cyclope nerita and Nassarius corniculus, that were found around the shore of Vulcano. Essentially, the nearer a colony was to a carbon dioxide vent, the smaller and weaker the individual snails were: with the shells from high CO2 seawater areas about a third smaller than those in “normal” environments. In many cases, these adaptations had allowed the snails to survive for many generations in extremely hostile conditions. The study, published in Nature Climate Change, provides precise details of how dwarfing occurs in a specific species and demonstrates how marine creatures will struggle to survive as our oceans become more acidic. Gizmag report says new furnace type solar collectors can melt glass in seconds. When SEMPRA uses rate-payer fees (i.e. taxes) to open their NEW SDG&E 'Energy Innovation Center' (i.e. propaganda center), they were met with protesters. Planning to charge people with Solar Panels a 'fee' for using the public electric grid. The California Public Utilities Commission (CPUC) rejected the SDG&E "Network Usage" fee.